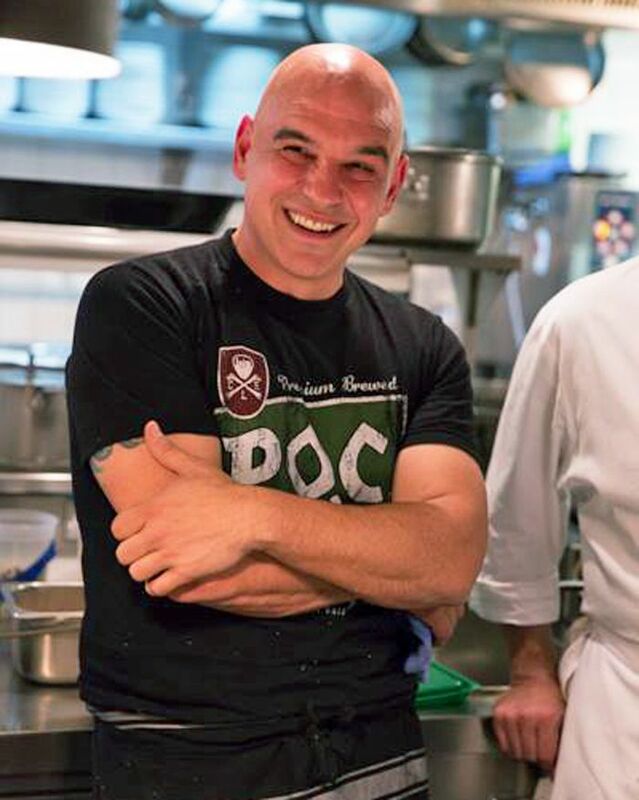 Cleveland native and Food Network Iron Chef Michael Symon has six restaurant concepts located in Cleveland and as far afield as Atlantic City, Detroit, and Washington, D.C.
Cleveland's favorite award-winning chef has also written four best-selling cookbooks and appears on the Food Network and Cooking Channel on such shows as "Cook like an Iron Chef" and "Food Feuds." He was a former co-host on ABC's "The Chew." Symon grew up in a Greek and Sicilian family and is known for his boldly flavored dishes using seasonal ingredients. In 2009 he was awarded The James Beard Foundation Award for "Best Chef: Great Lakes," and the Detroit Free Press named his restaurant, Roast, as "Restaurant of the Year." Located in the East Fourth Street Entertainment District, Lola Bistro is the signature restaurant of Food Network star, Michael Symon. The food is eclectic and well-conceived, making use of regional produce and meats. Favored dishes include beef cheek pierogi; sweet potato gnocchi; and smoked Hampshire pork chop. Lola is known for their extensive wine list which is curated by Symon's wife, Liz. Lola is open for dinner seven nights a week. Reservations are a good idea. The B-Spot originally opened in Woodmere, in Eton Shopping Center, in 2009. Two other locations opened in Strongsville and Westlake (at Crocker Park). There is also a location in the Quicken Loans Arena that is open only for Cleveland Cavaliers games, and another at FirstEnergy Stadium in the Club Lounge and Luxury Suites. The concept of these Symon restaurants is good, simple food in a casual setting. Menu highlights include a choice of 13 burgers (try the Porky burger with pulled pork, cole slaw, bbq sauce, and bacon), five variations on the bologna sandwich, a selection of draft beers and bourbon, and seven Bad A** shakes. Symon opened the huge (8,000-square foot) "Roast" in the historic Westin Book Cadillac Hotel in downtown Detroit in the fall of 2008. The eatery was named the "2009 Restaurant of the Year" by the Detroit Free Press. Roast seats 200 and spaces include a lounge, main dining room, and small private dining room. Look for meat-centric fare on the menu which features steaks and chops prepared in Symon's creative, bold style. Angeline is a classic Italian restaurant at the Borgata Hotel Casino and Spa in Atlantic City, New Jersey. Symon has taken favorite family recipes, including his mother's signature red sauce, to feature at Angeline. From hand-made pastas to wood-fired swordfish and steaks, diners will find the satisfying bold flavors Symon is known for. A unique dining option is the "Sunday Supper" which is actually available every day. The meal is served family style and includes an antipasto, garlic bread and cavatelli; sausage and peppers; "Mom's Meatballs;" with Rapini cassata cake for dessert. Who wouldn't want some Michael Symon comfort food when at an airport. Bar Symon locations are in the Pittsburgh International Airport (PIT), Philadelphia International Airport (PHL), Washington Dulles International Airport (IAD), and Cleveland International Airport (CLE). While waiting for your flight, you'll enjoy a tap house setting with such Symon creations as the award-winning Fat Doug Burger with coleslaw, pastrami, stadium mustard, and Swiss cheese. Or delve into a pulled pork sandwich. Bar Symon is equipped with power outlets at every table and bar stool as well as flight status screens. Mabel’s BBQ is a Cleveland-style barbecue restaurant located in downtown Cleveland. Symon incorporates local ballpark mustard into the barbecue sauce, uses Eastern European spices and smokes the meat over local fruitwood. Mabel's has arched ceilings, industrial lighting and exposed brick which gives the restaurant a laid-back rustic feel. There are communal picnic tables which adds to the fun atmosphere. Diners enjoy brisket, kielbasa and Cleveland kraut and pickles, and pork ribs with Eastern European-inspired seasonal sides.